Our mission as University of California Master Gardener volunteers is to extend research-based gardening and composting information to the public through various educational outreach methods. We strive to present accurate, impartial information to local gardeners so they have the knowledge to make informed gardening decisions in regard to plant choices, soil fertility, pest management, irrigation practices, and more. The Master Gardener volunteer program was started in the early 70’s at the University of Washington. Farm Advisors became overwhelmed by all the incoming calls from home gardeners and homesteaders so they trained volunteers to answer these questions and the “Master Gardener Program” was born. The first University of California Master Gardener programs began in 1980 in Sacramento and Riverside counties. 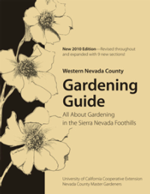 The Nevada County Master Gardener began soon thereafter in 1983. In 1991, we partnered with NID to develop a Demonstration Garden as a way to show and tell about good gardening practices.